January 14, 2005 Darmstadt, Germany - European Space Agency scientists celebrated today after the first raw images of the Cassini/Huygen space probe sent back the first images of Saturn's moon, Titan, which has been shrouded by thick atmosphere until now. 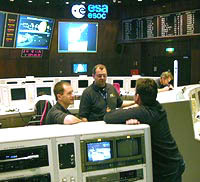 ESOC's Main Control Room (MCR) at 14:12 CET, 14 January 2005, as flight control staff wait for first data from Huygens probe as it descended to Titan's surface. Composite of Titan's surface seen during descent on January 14, 2005.